As we reach the six-month mark since Medilink Algeria officially opened for business, we take a look behind the scenes at our Algeria operations in an interview with Dr Mounir Ferrani, Medilink’s Chief Medical Officer in the country. Dr Ferrani shuttles between our Medical Centre at Hassi Messaoud and Medilink Algeria headquarters in the capital, Algiers. An occupational health physician, Dr Ferrani joined Medilink last autumn after a 13-year career as medical director in a joint venture company between Sonatrach, BP & Statoil. Our Hassi Messaoud team comprises an emergency physician, a nurse, radiologist, laboratory technician and an ambulance driver. They take care of the medical activities under the authority of the site doctor. 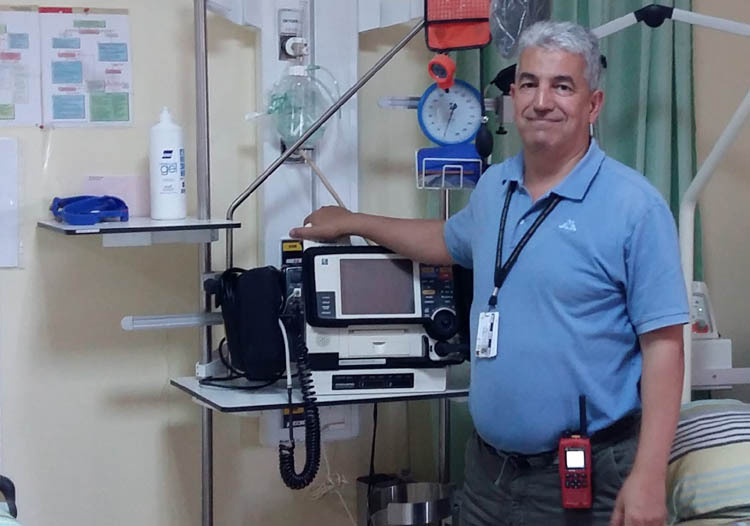 I oversee the Hassi Messaoud Medical Centre from Algiers and liaise face-to-face on site one week a month as well as at other times as required. Our team is of course available round the clock, 24/7, at the Hassi Messaoud Centre. Medilink services on the ground in Algeria include specialist consultancy, medevac, occupational health routine examinations such as fitness for work, abnormal audiogram, and legislative reminders to clients, as well as the supply of emergency drugs, vaccines and serums and so on. How do you feel Medilink Services have been received in Algeria? I’ve been gratified by the way Medilink, as new medical services company in the country, has been welcomed by the various hydrocarbon extraction companies operating here. They now have more options in terms of supplier and a competitive, flexible choice of services for their remote medical needs. Client companies are reassured to find a new, modern, permanent full-service medical centre at Hassi Messaoud capable of performing all the tests they require for their staff. How does Medilink complement and work in partnership with local Algerian medical services? We have set up agreements with private clinics to complement our operations in Hassi Messaoud and Algiers, and in other parts of the country. These types of partnership help complete our cover for medical and surgical emergencies in the event of a medical evacuation. We also work with a local clinic to provide CT scans and ultrasound and to offer consultations with specialist doctors. Does Medilink serve the wider local community and if so, what kind of services does it provide? It’s early days, but we most certainly have plans to help serve the local community. We have already had meetings with the directors of public hospitals as well as private specialists in order to set up a plan of mutual assistance. On our side, we targeted several areas in which we can provide assistance, such as in the provision of medical documentation for the benefit of the hospital library, and in training. For example, we could extend training to some physicians, allowing them to benefit from our medical training plan. What would you say are the Medilink Algeria services most in demand? Medilink in Algeria offers extensive know-how in medical services tailored specifically to the requirements of companies operating in the hydrocarbon sector, as well bringing on-site and field experience of working in remote areas. Our background gives us an edge in emergency medical care and occupational health of not just oil and gas sector clients but also other industries operating at remote sites. To date, this expertise hasn’t been easily available, 24/7, in Algeria and there has been a lack of formal medical infrastructure to serve these industries. Our expertise also in international training and certification (for example, BLS, ACLS, PHTLS, HACCP, and similar) is of immense value to those working remotely on production and oil rig sites and platforms. Where do you see as the strengths of Medilink in Algeria? One of our key strengths lies in the expertise of our staff, most of whom have significant experience working in major international companies. In my case, I’ve worked with Sonatrach, BP and Statoil, and many of my colleagues have similar backgrounds and insights gained across the extraction industries. This gives us a keen insight into the health, safety and medical care required to serve effectively in remote areas. Another plus for Medilink’s operations in Algeria is the international back-up we receive from a team of experts on call 24/7 coordinated by Medilink head office in Malta. These services range from logistics, medical supplies’ provision, specialist consulting and topside support to an emergency alarm centre managed by health professionals. Our ability to offer full-service, one-stop-shop in remote site medical assistance is certainly a major strength of Medilink Algeria’s operations. For you personally, what have been the highlights of Medilink’s work in Algeria so far? Personally, I can say it’s been a pleasure to take on my role with Medilink and gain access to their professional management resources and support. The company has spared no expense in ensuring it has the components in place to serve its Algeria clients to the highest standards. If your entity requires medical services assistance in Algeria, whether at remote sites or across the country, find out more about Medilink Algeria and feel free to contact us to see how we can support you and your staff.